Newtown is Great Yarmouth's polite northern suburb, which grew up as the town increased in popularity as a seaside resort in the second half of the 19th Century. It has a feel of a place apart, not least as a result of its separation from the town centre by Yarmouth's vast cemetery, and from a distance you might think that this grand building was its town hall. In fact, it is Newtown Methodist Church. The building was a fruit of a split in the Methodist movement in the 1870s when large numbers went off to form the Wesleyan Reform Movement. Newtown Methodist Church was built as a Wesleyan Reform church. The first church on the site was a simple hall of 1891, which doubled as church and school. In 1907 it was replaced by the present fine structure, with its squat bell tower and projecting clock. Ben Milner's excellent History of Methodism in East Norfolk notes that considerable energy and success went into raising funds locally, and there was also a grant from a national fund. In 1912, they bought the organ from St John's church near the seafront, but it was so big that the vestry had to be demolished and the church extended to accomodate it. Newtown Methodist was not taking part in the 2010 Historic Churches Bike Ride when I visited, and so I have not seen inside. 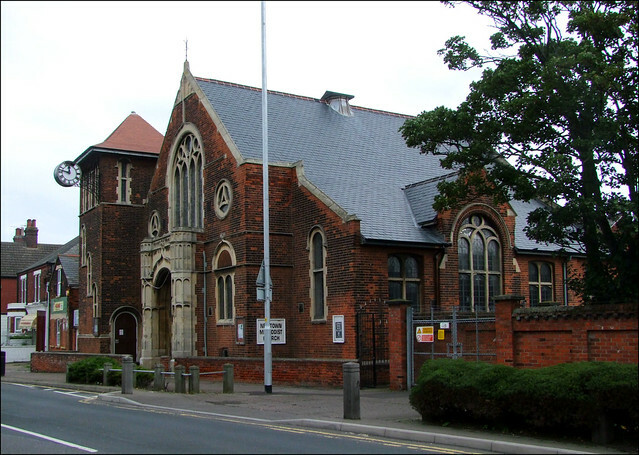 It would be interesting to see if the interior matches the exterior for sheer quality, because this must be one of the best-looking Methodist chapels in Norfolk.